With all consumer goods, pricing is based on the provider’s cost – which fluctuates due to a variety of factors. You might begin to notice some price increases on all types of products throughout the year, which is directly related to a nationwide shortage of truck drivers. As for the wood pellet industry, these unrelenting transportation issues have made price increases a certainty for 2018. For years, there has been a growing shortage of qualified CDLA drivers, and it has only gotten worse over the past year. 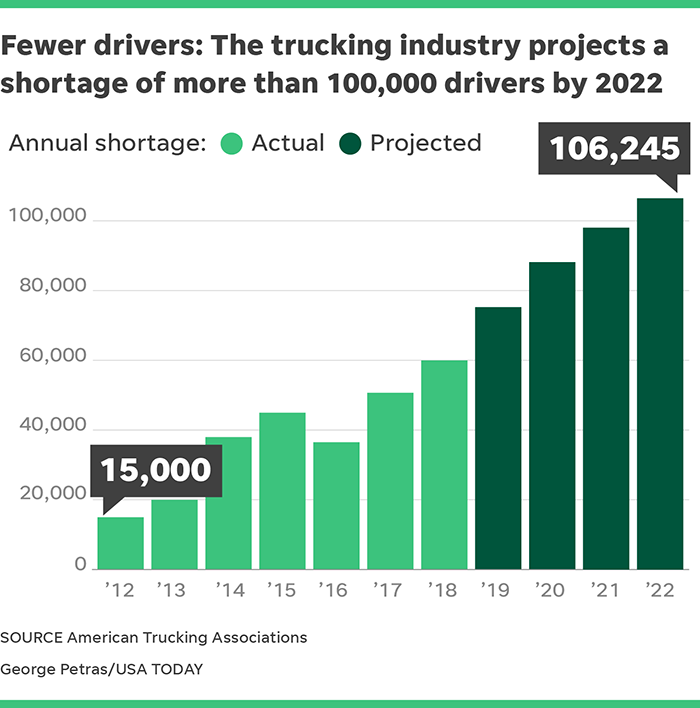 According to the American Trucking Association, there’s a shortage of 51,000 truck drivers nationwide, up from 20,000 in 2013 and 36,500 in 2016 with a predicted increase to nearly 100,000 by 2021. As driver supply has dwindled, more trucking companies have turned to intermodal rail, which has even made these containers scarce. Why is this shortage happening? Baby Boomer drivers are retiring due to age, stricter DOT medical certification processes, and frustration with newly required Electronic Log Devices (ELDs) which have created tighter hours of service regulations. This technology – which is designed to enforce limits on driving time without breaks – has not only pushed many seasoned drivers to quit, but also reduces the number of trucks available overall. Additionally, millennials are far less enthused than previous generations to join the trucking force due to the arduous duty of long cross-country trips, away for days and weeks at a time. Furthermore, the men and women completing tractor trailer schools these days are not always accepted by insurance companies, which often require at least three years of driving experience. What does all of this mean for wood pellet stove owners? It’s understandable that just like any fuel, wood pellet prices fluctuate – but the effects of this trucking shortage have turned the risk of a 2018 pellet price increase into a reality. Previous article Upcycle Challenge: Win a Free Delivery Voucher!